UsMeU uses IBM's Watson, the Jeopardy winning supercomputer to do a psychology analysis of a person's Twitter posts. Watson's Artificial Intelligence is trained to use linguistic analytics to extract cognitive and social characteristics, including Big Five, Values, Needs from Twitter tweets or text data. 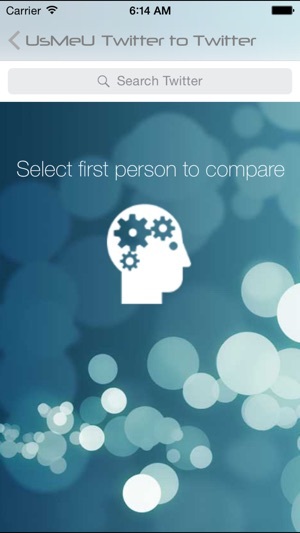 Compare two people to determine their compatibility see what Watson has to say. Share the results on Twitter, Facebook or email. Freakishly accurate! Must try this! 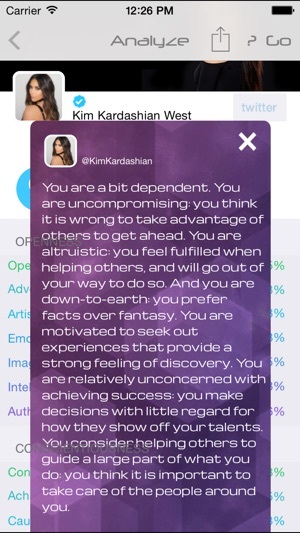 Incredibly accurate personality profile based on linguistic analysis by IBM's Watson.